The other week in my school library, I was assigned a year 6 pupil for a day whom I never normally see. He’s not that into books or reading and shies away from the library space unless his friends are hanging there on hot days when it’s the coolest room in the school. So when he was assigned to me, there was a fair amount of reluctance. And yet, by the end of the day, there was a glint of enthusiasm there, a realisation that books aren’t bad. He read to younger students, held a book treasure hunt, and even agreed he’d come back (and not just for the chocolates!) It’s all about changing someone’s mindset. 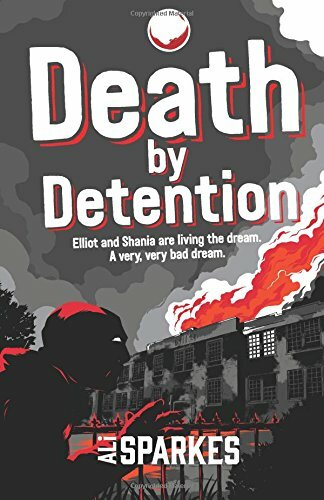 Prolific children’s author Ali Sparkes is attempting to do the same thing with her latest novel, Death by Detention. It’s aimed at slightly older children than her usual books, aimed at the young teen reluctant readers, and although I don’t quite fit that mould, I’m captivated by a great story well told, and this fits that bill too. The protagonists aren’t bookish or scholarly; they aren’t misunderstood geniuses but regular, can’t be arsed, worldly teens. Their attention spans are fairly narrow and they’re just the type of troubled teens who sit in detention planning their next game of Fortnite rather than concentrating on the homework in front of them, and they definitely don’t read books. This book begins with these two teens, Elliot and Shania, in detention. And the book doesn’t hesitate – before the end of the first chapter, Elliot and Shania witness their head teacher shot from an unknown marksman outside the window, and then watch in horror as a laser beam seeks out further targets. They have to use their wits to make their way out of their deserted school before the gunman or men, realise they are there. What’s more, their head teacher looks as if he might be coming back…as a zombie. For this generation of teens, there will be inevitable comparisons with Alex Rider type novels, but Elliot and Shania have to rely on their quick-wittedness and resourcefulness rather than some James Bond type gadgets in order to survive. And this is where Sparkes (and the reader) have a lot of fun with the novel. By using the precise orientation of the school as the setting for the entire novel, Sparkes is able to explore all the fun hidden spaces within its site – stationery cupboards of course, but also the high windows of a school gym, the maintenance crawl space above the toilet ceilings, the tannoy from the head teacher’s office, reception, and of course the gym cupboard. And as everyone who has read a high school drama knows – there’s plenty of scope to be had in the school theatre space. This meshes nicely with computer games – each action sequence is in a different setting. Sparkes also captures the extreme physicality of the teens’ situation – they are not just running away or confronting the gunmen, but they feel their cramped limbs from hiding, they vomit in fear and relief, their hearts palpitate and they go into cold shock. What’s more, as the reader roots for them to succeed, Sparkes alternates between the two protagonists’ point of view – their headspace – seeing not only what’s in front of them, but also thoughts about who they are, how they came to be in this situation, and the resilience and skills they might draw upon to see them through. It’s the clever writer’s way of drip feeding information about the main characters and Sparkes works her magic here, as well as proving her knack of showing character through action – there is no lengthy exposition. The beauty of the book is that it reads like a computer game – it’s fast, pacey, gripping, and yet in prosaic format – Sparkes has time to give us apt similes – “Normally she attracted cops like a dropped Cornetto attracts ants.” The chapters are super short, ending in gritty cliff-hangers, much like levels in computer games. Her descriptions don’t interfere with the action, but merely enhance it – there is a multitude of sensations giving the text a visceral feel. The reader sees what’s dark and light, where the shadows creep, the sounds of silence and of approach and of violence. And this perhaps is where readers or gatekeepers may feel a jolt. Sparkes reportedly failed to attract a mainstream publisher for the title – there are so many fears about showing a gunman in schools in a novel for children after the number of real school shootings in the States. But I would argue that if publishers shy away from novels that may offend, then much of publishing would fall away, and be worse for it. In the same way that computer games don’t shy away from it, in the same way that dystopian novels portray children battling to death, or incidents of terrorism, then this shouldn’t be out of bounds here – particularly when in actuality this story is positioned very far away from what we think of as ‘school shooting’ or ‘act of terrorism’. In fact, there’s much humour. There are numerous wry asides – the headteacher is positively brilliant at releasing humour into scary situations and is as sharp as a pencil, and the teens fare well in this regard too. This is a fabulous entry or re-entry into books for reluctant readers. Short, sharp, witty and great fun, the reader will understand that it’s not great to judge someone by the stereotype attributed to them, in the same way that they’ll understand that facing a gunman with a resistance band and a cricket ball from the gym cupboard probably isn’t the best solution. This up-to-the-minute pacey novel is a match for the screen any day. I’ll take detention – if they’ll let me read stories like this during it. Suitable for 11+ years. You can buy yours here.